Published with the kind permission of the Circle of Ostara. in part without their express written permission. Few of our divinities have been as much maligned by mythological compilers as Thor. There is no doubt that in the elder days he was an extremely popular god, one who was considered to be the patron of the people, a ready champion in times of trouble. This very popularity caused Snorri Sturluson and his like to go to great lengths to denigrate him. Before Christianity, oaths were sworn on Thor’s Hammer and this symbol was worn by men and women alike as a protective talisman. It is inconceivable that such regard would have been given to the demonic character of Snorri’s stories. Thor is being at once connected with the powers of nature and the affairs of men. He appears as a wild and menacing, roaring, violent force that sweeps through the sky with crashing thunder and lightning flashes. Yet he is a god of agriculture, a guardian of crops and fruitful fields. It is a strange natural fact that summer lightning over the fields is necessary before the Earth can properly utilise nitrates. Thor is depicted as being the opponent of the giants, yet it is obvious that he is a giant himself, a primal force that has somehow become part of the “evolutionary team” that shapes our people. He is said in story to be the son of Odin and the Earth, personified, a fitting symbolic expression for the apparent dual role he plays as a wielder of a great “natural magic” and a divinity with a deep interest in the welfare of our people. He too is not difficult to reach, and not only in dreams and meditation. He has a very human sense of humour and in reaching out to greet him we have had experiences which show that he, more than the other gods, is willing to demonstrate his presence and awareness by means of physical happenings overtly manifested in the World of Form. Grateful showers for mortals sends! Prays to Indra, God of War! Be to him libations given. For thy blessings’ endless store. There are some who, while claiming to be Odinists, will tell us that Thor, under the name of Indra is still worshipped in India by the Hindus. Some few millenia ago this was no doubt true. 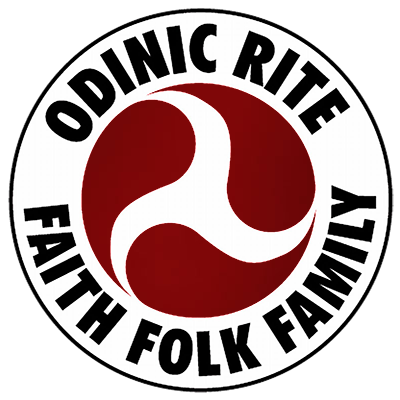 The ancient Aryans, in their progress down into India, of course were practitioners of an organic religion which had grown from the same roots which has also produced Odinism. They were closely allied to North Europeans racially. Their Indra was Thor. However, as the racial integrity of these people was lost so too did they lose contact with the old gods of the Aryans. The peoples of India today, a very different ethnic grouping, certainly worship a god called Indra, but he is just as certainly not Thor. This development of Hinduism is well documented in the Hindu scriptures themselves. In the early Vedic mythological material the highest and most venerated gods were called the Asuras (Æsir). As time, and the loss of racial integrity, progressed, however, the term Asura became degraded until today (and for many centuries past) the Asuras have become the opponents of the present-day Hindu pantheon, a natural enough occurrence in organic religion. For ourselves, as modern day pagans, Thor is a close and heartening spirit, easy to reach and easy to communicate with. He can be invoked in meditation and approached in “dream” but also, more easily than with any other god, he can be called upon in times of danger and will respond instantly. Thor is the giver of courage at those times when we are beset by enemies and facing cruel odds, at those times when our hearts fail us. A call to him will bring a surge of new strength and vitality, a banishment of fear. We have a ritual invocation for Thor, very helpful for deep meditational work. However, in times of trouble it is sufficient to call or even whisper his name. To destroy the enemies of our folk, our faith and our families. In the old stories the goddess Sif is said to be the wife of Thor. As with so many of our goddesses, who were considered by our pagan ancestors to be as holy and as powerful as the gods, she is given little attention by the Christian compilers. And yet Sif, the goddess of the golden grain, of the harvest and of bread, is a great and potent deity in her own right, and not merely as the spouse of the mighty Thor. In these old tales she is mentioned as a victim of the mischief of Loki who is said to have stolen away her long golden hair. This story can be seen in one light as a parable for our times wherein her hair, a symbol for the grain once grown naturally and fertilised naturally, is taken away by the mischief-making technology spawned by Loki and replaced by the inferior harvests produced by the use of poison and artificial fertiliser. This may be very instructive for us but it does little to enable us to find our way to communion with the real Sif, a goddess reverenced by our people since they first planted grain in their fields. With the movement of populations away from the countryside into cities our people have lost touch with Sif, yet even in recent times, within the past two centuries, she was held in respect by the farming communities and paid homage to by the customs of making corn “dollies” and the festival of harvest home which was her festival despite its Christian veneer (the harvest festival was introduced in churches only in Victorian times). Many tales in folklore are told about Sif. The fields of ripening grain, tossed in waves by the warm winds of summer were said to be her shining golden hair; the dancing heads to the corn, bowing and waving, were said to be moved by her feet as she passed over the fields. Writers on mythology will tell us that Sif is merely a personification of the cornfield. We do not, of course, agree. She is a reality. In a natural world the corn itself is in her care. She is not a personification of the corn, rather the grain is manifested by her will, it is a gift, however we may have abused it, from her to our people. It is an interesting fact that wheat is not really a development made by human plant-breeding techniques from lesser grasses. It appears to have arrived suddenly in the world: there are no “fossil ancestors” for wheat. It was created and given to us by divine forces, by the gentle Sif herself. The cornfields are a manifestation on the Earth of her love for us. And yet the power of Sif appears to be slowly withdrawing from us. As we abuse her gifts the nourishing potency of the wheat decreases. Scientists, attempting to recreate the technology of our pagan ancestors, have grown wheat from seeds found in old graves (seeds still viable!) and have found this wheat to extremely resistant to disease and insect pests and to have a much higher protein content than the modern wheat which has been interfered with by “progress”. For those who live in cities to make any sort of communication with Sif is difficult. Only those who have returned to the old natural ways of agriculture would have any success in this. She has not lost interest in us. She waits for us to remember her.